In just over a month, 5,000 of the world’s brightest iOS developers will descend onto San Francisco to attend Apple’s Worldwide Developer’s Conference. In 2013, the conference sold out in under 2 minutes. Since then, Apple has instituted a lottery system in order purchase a ticket. 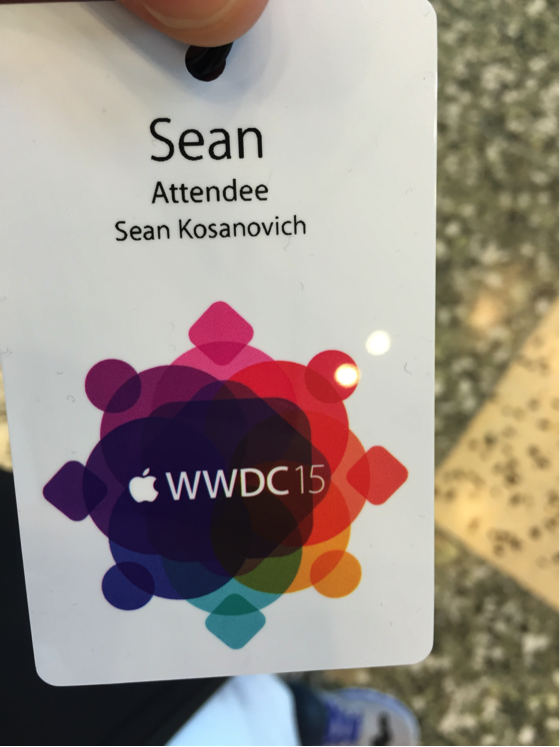 I have been lucky enough to have gone to WWDC in 2014 and 2015, and I will be attending again this year. 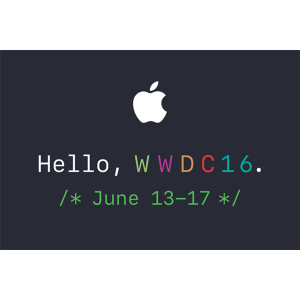 Last year, Apple announced that 80% of the attendees were attending their first ever WWDC. This year will likely be a similar story, with lots of attendees coming for their first time. 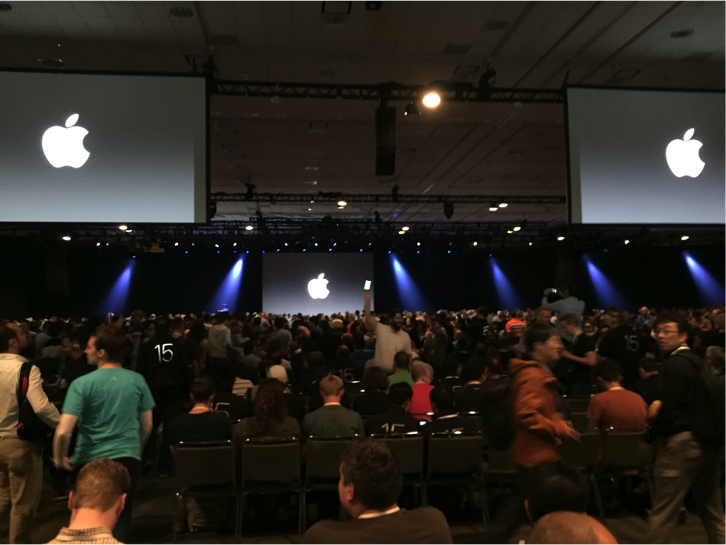 WWDC is an extremely large conference and can be overwhelming for those who have never attended. Below are some tips for newcomers to make the most of the conference. You can register any time during the week, but you will want to register on Sunday before the conference starts. Once you register, you will receive your badge and a light jacket. It is important not to lose your badge as Apple will not reissue a badge and you cannot get into the building without it. Monday is a light day for WWDC. It starts at 10:30 AM with the familiar main Keynote that is broadcast to the public. Later in the day, typically around 2:30 PM, Apple holds a 2nd keynote called “Platforms State of the Union.” This keynote is very important to attend, but more on that later. Apple will close the day with its annual Design Awards, which typically starts at 4:30 PM. The main keynote that is open to the public is quite a production. In previous years, this keynote was held at Moscone West and the main room (Presidio) couldn’t fit all of the attendees. This meant that some developers had to watch the keynote on screens in an “overflow” area. This has caused people to line up at ungodly times (some even start lining up Sunday evening!). There is no reason to get in line that early. In the past, I have gotten in line around 6:30 AM and have easily made it into the main room. 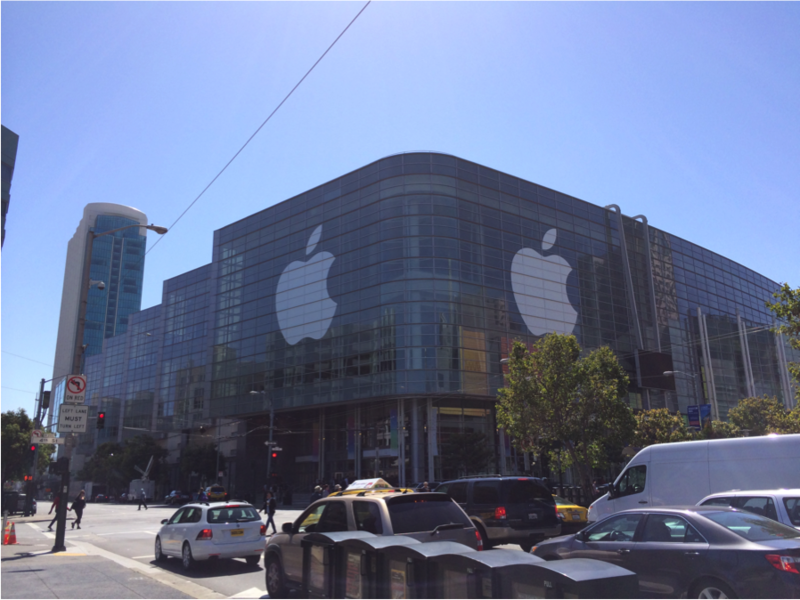 This year, Apple is holding the main keynote at the Bill Graham Civic Auditorium. This auditorium has a larger capacity than Presidio, so hopefully there will be no “overflow” room and everyone will make it into the main auditorium. The keynote typically lasts until noon. After the keynote, Apple provides lunch (they will provide lunch everyday). At all of the cafeteria-style tables, there are ethernet hookups that have fast access to all of the new betas of iOS, OS X, and Xcode. This gives you a good opportunity to test out all the new software that was just announced. After lunch, Apple will hold a second keynote (typically form 2:30-4:00 PM), and this second keynote is actually more informational for developers than the main keynote. Apple will go over all of the morning’s announcements and will get much more in-depth into the technical aspects of it all. In the case of Swift 1.0 and Swift 2.0, Apple actually did some live coding examples of the new language’s features. This is a keynote you will not want to miss! Following the Platforms State of Union, Apple will hold the annual Apple Design Awards. This is a light-hearted event that is aimed at celebrating the successes of third-party developers. Apple gives out awards from different categories. There is certainly no new information given here, so if you are exhausted from taking in all of the information from the Platforms SotU (or if you simply want to deep dive into the new SDKs), then this is an event that can be skipped. The rest of the week is devoted entirely to sessions, labs, and meet-ups. Sessions are similar to a lecture on specific topics and generally last about an hour. Labs are for sitting 1-on-1 with an Apple engineer for a specific topic (Swift Lab, Location Services Lab, etc). Meet-ups are Apple organized meetings to get developers with similar interests together (like an iBeacon meet-up). Sessions and labs are ongoing all day, while the meet-ups are typically scheduled after all the sessions are over for the day. At any given time, there will be upwards of 4 different sessions going on (and numerous labs). In total, there are over 100 sessions throughout the week. The full schedule will be made available shortly after the main keynote on Monday. This is where the WWDC app comes in handy to help you plan. It is a great idea to spend Monday night planning out (at least roughly) which sessions and labs you want to attend, which will give you a decent idea of what your week will look like. I would recommend going to as many sessions/labs as possible. It is easy to think that you’ll go back afterwards and watch the videos, but I find that rarely happens. Some sessions that are very popular will be repeated on Friday in case you missed something. Sessions wind down around lunchtime on Friday, as the afternoon is reserved exclusively for labs. This is a great time to get quality time in the labs, as the conference really thins out by lunchtime on Friday. On Thursday evening, Apple will host its Bash. You will need a wristband to get into the Bash, which can be picked up at any time on Thursday in the lobby of Moscone. Remember to bring your ID to prove you are over 21. The Bash is a really fun event where Apple provides dinner and an open bar. To go along with the party, Apple will host a band to play a small set list. In 2014, Bastille played and last year, Walk the Moon played. This event is a great time to unwind and take your mind off things for the first time since Monday. If you are under 21, Apple sets up a separate area so you can still join in on the fun. Every morning, a light breakfast of pastries, coffee, and juice is provided. Apple does provide lunch every day. The lunch is a boxed lunch that contains a salad, sandwich, or wrap, some sides, and drinks. They try to mix it up each day offering different types of meat, etc. It is pretty good, but it’s not going to blow you away. You can’t complain with free! Throughout the afternoon, snacks (cookies, candy, etc.) are provided. Apple only provides dinner at the Bash, so dinner is on your own. Luckily, there are many great places nearby and dinner is a great opportunity to socialize and make new connections. If you are looking for Apple swag (shirts, mugs, etc. ), Apple has a small store setup throughout the week. Some of the items are WWDC exclusives, while others are also available at the main company store in Cupertino. This is unique because you can only get these items from Cupertino, so having an opportunity to get it at the conference is appealing. If you are going alone, it helps to buddy up with someone for the week for information sharing and to have someone to speak with. While in sessions, keep your eyes open as Apple executives do sometimes attend sessions and walk around. They will talk to you and take a picture with you. 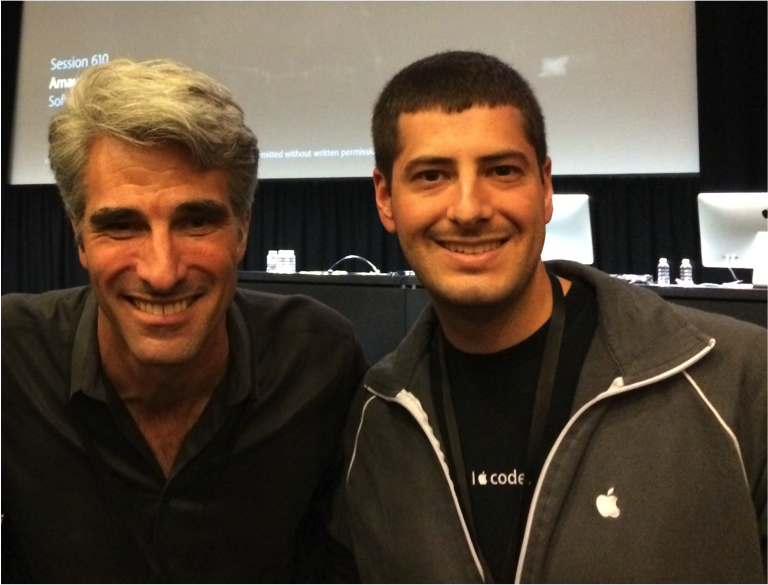 I was able to meet Craig Federighi, Apple’s SVP of Software Engineering, and chat with him for a few minutes, which was awesome. Don’t forget that everything covered at the conference is controlled by the NDA that you agreed to when buying your ticket. You should keep this in mind before live-tweeting sessions. There is great WiFi coverage at Moscone, so you shouldn’t need to bring any hotspots. Obviously bring a computer and any iDevices you have that you’re coding for, and it may be helpful to have a battery pack for your phone (for the Monday keynotes at least). At most of the seats (even in the sessions), there are a lot of power strips around to keep your devices powered all day. There are lots of WWDC parties in the evenings around town. Yelp has a very popular one. While these are for recruiting purposes, they offer a great chance to network with your peers, especially since it can be challenging to socialize during the day with all of the sessions. Lastly, remember to have fun, make some great new friends, and learn! WWDC provides an exceptional opportunity to work side-by-side with some of the smartest Objective-C/Swift programmers in the world. Do take advantage of this. If you’ll be there and want to meet up, you can find me on Twitter at @SKosanovich. Thanks a lot. I won a lottery for WWDC 2017 and the tips above will really help me.